Exactly within the no-waste trend, the boudin noir or blood sausage stands out in the meat-eater crowd favorites. Cheap and filling, yet delicious, blood sausage sees its popularity on the rise again throughout Europe, spreading over oceans to reach the most famous dining tables. One of the most ancient charcuterie, boudin noir mixes the most humble parts of the pig to create the richest and most flavorful sausage. Made with pork blood, grease, and condiments, the blood sausage sometimes contains goat or sheep blood, depending on the recipes. It was invented during the Antiquity by a Greek cook named Aphtonite. Blood sausage appeared for the first time in the “De re coquinaria” from Apicius, a Roman recipe book in Latin dating from the end of IV Century. During the Middle-Age, only taverns and inns would serve black pudding. 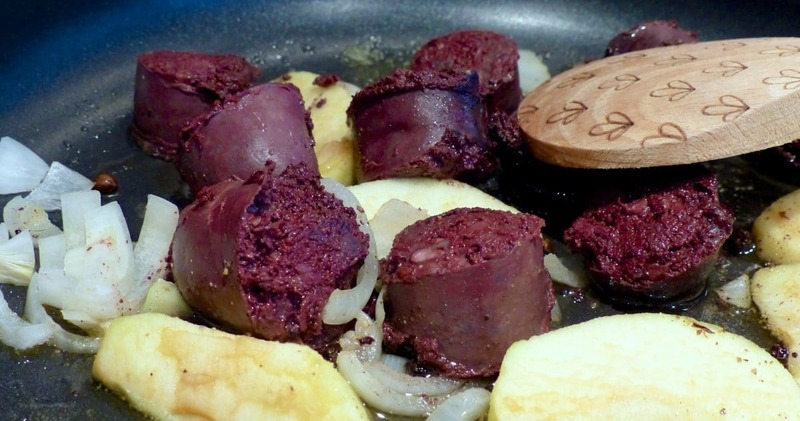 Traditionally, the blood sausage was prepared when a pig was slaughtered. Nothing should be wasted. Nowadays, blood pudding is eaten on many occasions. The preparation is simple: pig’s blood, pork grease, and onions are mixed together with spices, condiments, wine, chestnuts, and chard, eachdepending on the country or region. Blood serves as a spectacular food binder, much like egg whites, giving the sausage its smooth texture. The sausage mixture is then stuffed into pig’s intestines by hand. Finally, the sausage is boiled in hot water until no blood runs out. Usually pan-fried or poached, it can also be grilled. Served over a homemade potato purée, it is bold and big. 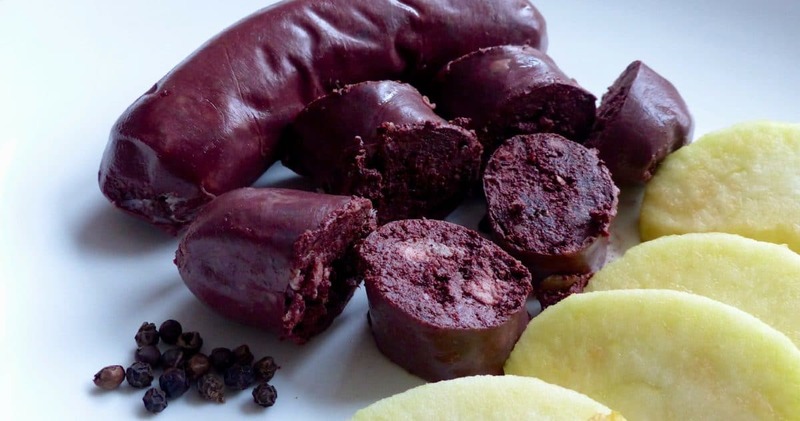 The delicate sweetness of cut cooked apples works well with the earthy and intense flavor of the blood sausage. Blood is a readily available ingredient everywhere. That explains why the black sausage has been popular in so many countries. Many variations can be found around the world. In Portugal, Spain, and most Latin American countries, blood sausage is called morcilla, and is usually served at a barbecue or in a sandwich. In Italy, it is named sanguinaccio. 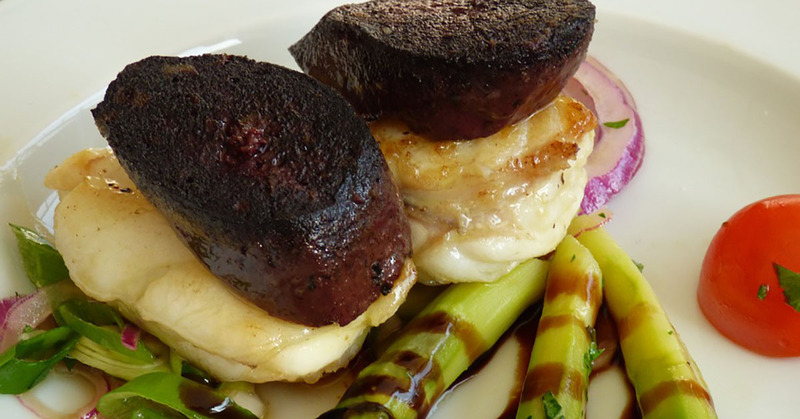 Blood sausage is known as mazzita in Malta. Go to Louisiana or France to savour the delightful boudin noir. It is so rooted in French culture that more than 16 recipes exist, almost one for each region. A Brotherhood of the Knights of Blood Sausage organizes a yearly competition for the world’s best boudin. In the French Antilles, taste the mini boudin, spicy and so flavorful. In the UK and Ireland, blood or black pudding is served at breakfast. A traditional Christmas dish in Estonia, verivorstid is made mostly with blood and barley. In Poland, it takes the name of kiszka, and is cooked with onions, served with rye bread, horseradish, and pickles. In Kenya, mutura can be referred to as African sausage. Served chopped in a roll with kachumbari, a diced tomato, and onion salsa, it has become a favorite street food. Order a soondae in South Korea and you will get a sausage, not an ice cream dish. A night market delicacy, it can be steamed and sliced or boiled in a soup with cabbage and other vegetables. Don’t pick the blood sausage with a fork, but with a needle instead. It won’t split in half during cooking. 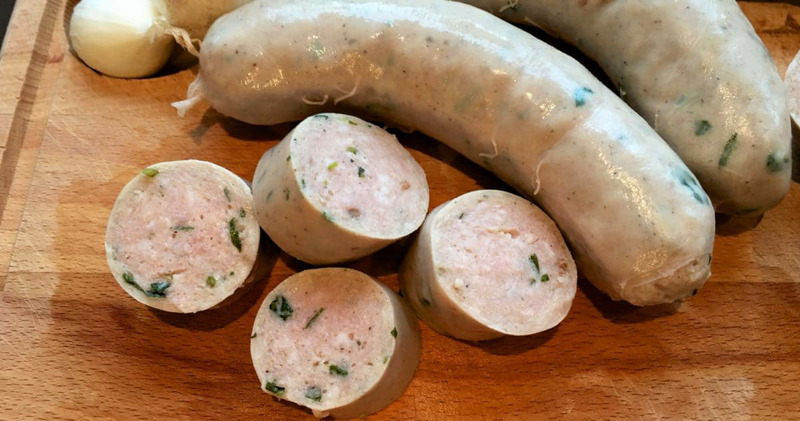 Keep some mini boudin in your fridge. They are delicious as an appetizer. Diced and mashed up, use the blood sausage in a parmentier for a last minute meal your kids will love. Boudin blanc doesn’t have an ounce of blood but is prepared with white meat, grease, and eggs, milk or another binder. Plain delicious with cooked apples or a fig chutney. Healthy or not healthy? That is a good question and the answer lies within the preparation of the blood sausage. A rich source of iron and protein, the black sausage also contains a lot of fat and is considered a processed food. Make sure you buy it from a trusted butcher and don’t overeat it. The key to get more people to appreciate it might reside in its name. Just don’t mention the word ‘blood’ and your guests or family may just find it intense and surprisingly delightful, just like these children in this video. Have you tried blood sausage? What is your favorite way of eating it? 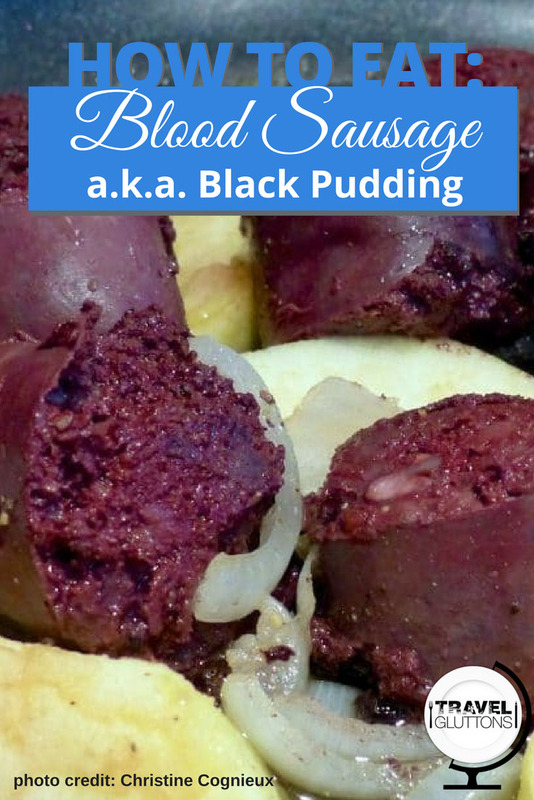 11 Responses to "How to Eat: Blood Sausage or Black Pudding"
Great post! I have tried the Korean version you mention – you can get it with dalk galbi as well as a night snack, and tbh I was not a fan. People (especially my Irish bf) keep telling me that I need to give the real thing a go though! Thank you Prianka. I personally never tried the Korean version but definitely the French one. My husband doesn’t like it but I just love it with the baked apples. Give it a try the next time you are in France and if you don’t like it I am sure your bf will finish your plate. This is the number one thing I miss about living in the UK. I am sure you enjoy them even more when you have the chance to go back home. Hi Adriana, it is for sure an acquired taste. Some recipes might be stronger in flavor than others but you are so right, if you can get your mind to just skip the “blood” word, you would be so much easier. Blood sausage is one of those things I was sure I would like. But I’ve had it a few times and just don’t like it. Maybe it’s just that I have not had GOOD blood sausage. I am always baffled when I try it again and still don’t like it. Maybe if I try to Korean or French version I will change my mind. Hi Danielle, it is great you actually tried. It is an acquired taste, or not! Love your Blog! As an airline pilot, I feel so darn lucky to not only do what I love, but as an added bonus, sample the cuisines of the World locally, and meet many great folks, and share in their culture. I was raised on Blutwurst as a third generation product of German and Czech immigrants. Leberwurst and Blutwurst were a standard in our house. In my travels, I found it incredible how prevalent this delicacy was in so many places, from certain regions in the US, to Eastern and Western Europe, Asia, Africa, South America. I understand some it bothers people because of the name, I just ask my friends I cook for to try it. Yes, some times I’ll use a more exotic name like boudin noir >bg<, but I'll always ask them first if they have any aversion to trying what make, no matter what I callout. Cheers!